Competition is increasing in the international market, making the demand for skilled employment within the areas of marketing, economics and human resources even higher. Especially if one person is able to work with different assignments across all fields. Our BA degree in International Business gives you the most important tools you need to solve the kinds of complex challenges that occur when working in an international environment. You will gain insights into specific techniques and methods within financial management, intercultural communication and human resource management, enabling you to work on your assignments in a very professional way. Admission requirements: AP degree from International Business Academy or an equivalent school, or another degree at the equivalent level. Additionally, English at a certain level. Duration: 1.5 - 6 years, 120 CATS (60 ECTS). Tuition: Price for registration is DKK 7,500. Each unit costs DKK 5,000 (8 units in total). The research project costs DKK 12,500. The total price is DKK 60,000. The bachelor in International Business is a part-time and international programme, offered by Leeds Beckett University (subject to approval) in co-operation with IBA International Business Academy in Kolding, and is 100% via e-learning. It is a top-up programme that corresponds to the third year of a full-time bachelor and builds on top of two year programmes like the Danish AP degrees or the British DipHE or HND programmes. Choosing an e-learning programme gives you maximum freedom and flexibility during your studies. The classes are a combination of live online seminars and teaching via our digital platform. All seminars are recorded, so you can watch them regardless of time and place. As well as having access to both the IBA’s and Leeds Beckett University’s libraries and electronic databases, you can use other university libraries, so you’ll have the benefit of learning resources close to where you live. There is also an opportunity to attend an annual residential at Leeds Beckett University (subject to approval), if you like. With this bachelor degree, you are well-equipped for a career in an international company. You get skills that will strengthen your job options within marketing, financing and human resource management in a global market. The BA degree is also one step further up the educational ladder to a master’s degree. On successful completion of the bachelor degree, you can progress automatically to a master’s degree at the IBA, or use your credits to complete a degree at master’s level at another university in Denmark or abroad. To be accepted to the programme, you must have successfully completed a 2-year AP degree from International Business Academy or an equivalent school, or another degree at the equivalent level. 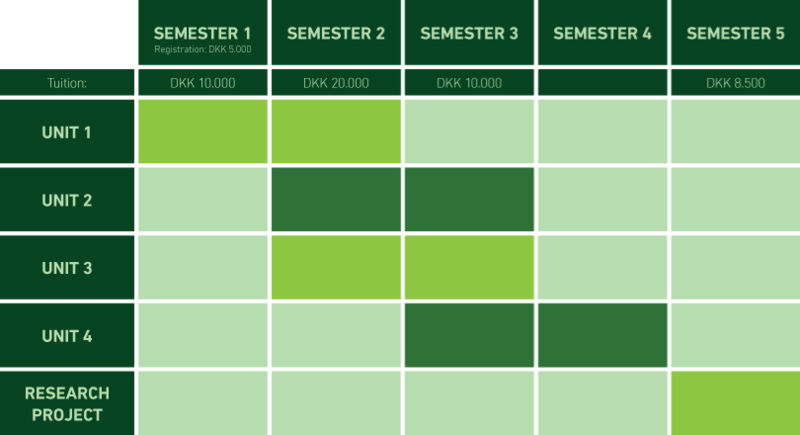 The total tuition fee of DKK 60,000 covers the first 3 years, and if your studies continue after that, you will have to pay an additional registration fee per year of DKK 1,000. The tuition and registration fees include all teaching, learning support and administrative costs, but are exclusive of books.